Congratulations! You’ve made the choice to attend ASAP’s Administrative Professionals Conference (APC) or the Executive Assistants’ Summit! 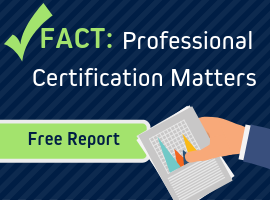 This means you have also successfully shared the value of attending with your Executive who supports your commitment to your personal and professional development and the benefits it will have for you, your Executive, and your company. Now, how do you make the most of this choice? Your commitment to attend is only the first of many steps you can take to gain the maximum benefit from the time you spend at APC. Go “all in” with specific goals in mind to improve your knowledge and skills and be even better at your job. No matter how much experience and education one has in the administrative field, there is always more to learn – and you will always learn something new at APC. Prepare yourself to go “from good to great and from excellent to exceptional” as Judy Geller, ASAP’s Executive Director incents us in her letter in the APC Preview Brochure, available for download here. If you didn’t already when you registered, join ASAP for conference discounts, flash offers, and the monthly newsletter that frequently features APC trainers. Register for the Monday Night Out ($99.99). It’s a great way to meet new people and get outside the conference hotel! Pack at least one item to wear at the themed Tuesday Night Party. Download the APC Mobile App when it launches (usually a month beforehand) and set up your profile. Include your photo to help people recognize you! 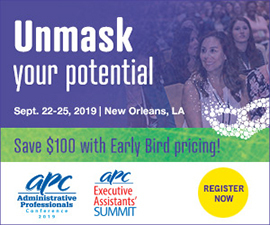 Reconnect with contacts from last year’s APC in advance of the conference and make plans to meet on site. Plan to attend these “do not miss” events: the Welcome Reception and Networking, Special Features and Inspiring Keynotes, the Tuesday Night Party; Exhibits at APC (find new services/resources and enjoy great giveaways), APC bookstore (tip: purchase keynote books in advance of the keynote session for signing); and the Head Shot & Profile Lounge (new this year). Go to the Conference Orientation and Networking Session. Whether you are a first-time, solo, or repeat attendee, this session provides an excellent overview of the conference and gets you motivated and ready to engage! Create a personal plan for each session you registered for to get the maximum benefit. Take notes and write down at least 1-3 takeaways/strategies you can bring back to the office with you. Highlight items you plan to implement. Network. Network. Network. Immerse. Meet and surround yourself with new people to interact with during sessions, lunch, and events (even if you came with others from your company). Introduce yourself and exchange contact information (the APC Mobile App makes it easy)! Take advantage of the unique opportunity you have at APC to meet like-minded individuals from all over in different industries. You’ll find this information exchange is invaluable. Get to know your ASAP team. Be sure to stop at the ASAP booth during the Exhibits at APC. At the booth, you can join ASAP and learn more about the benefits and resources it offers such as articles, the FastTrack newsletter, training, webinars, PACE certification, CEU credits and more. Seek out APC/EA Summit Advisory Council Members and Golden Ambassadors (designations on conference badges) with any questions you have about ASAP and the conference. They want to assist and guide you through your APC experience and help ensure it is the best possible for you. Be present at each session! Be real, share your experiences and ideas, and look for opportunities to contribute to the discussion. Believe that what you have to say is meaningful and that your fellow attendees could benefit from your insights. Commit to attending each session on your schedule and feel free to change sessions if you find one you selected doesn’t suit you (APC’s Information Desk is happy to help when there are openings). Avoid the temptation of skipping sessions to explore the town. You’ll have that opportunity at APC’s Monday Night Out or on your own after you complete Monday’s sessions, and at Tuesday’s party. Enjoy yourself along the way and have fun celebrating our profession with your colleagues and new friends! Come back to the office empowered, motivated, and re-energized! Schedule time to connect with your Executive via a (brief) one-on-one meeting, summary document, or email within 1-2 weeks of your return. Share the key takeaways and contacts you made at APC. Plan to implement at least one new idea or strategy with your Executive or company that you can directly relate to your attendance at the conference. This will demonstrate the return on their investment and support your continued attendance to this conference. Stay in touch with the individual contacts you made during the conference. Follow-up with at least one special connection to inspire, motivate and help each other to make progress towards each other’s goals. Create a valuable network you can rely on throughout the coming year and beyond. I hope this suggested checklist makes you feel prepared and excited for an amazing experience at APC. Follow it and you’ll arrive ready to make the most of this annual opportunity for growth and personal development! Can’t wait to see you there!